Together with a team of social workers when and where I had the wonderful time working with the poorest of the poor of the Mauritian society, I discovered in practice, one of the main issues that keep these poor humans from moving to improve their conditions. They were not only the rejected of the society: they were themselves rejected by themselves. The poor Worthless! The non Humans! The team at Caritas, after much thinking and reflection put up a program to boost up first the team of social workers to boost up their self esteem to initiate in them their capacity to take charge of themselves. The larger picture or objective was to put Caritas in the mode of Empowerment. The way to empowering the organization, Empowerment of the social workers there in and Empowerment of the poorest of the poor was the new mantra. Looking back 5 years after, I am amazed with the work accomplished but more importantly pleased with the positive effects that the impact of the program on the society. The government through IVTB is now asking the Caritas program to run some programs. Under the new branded name ‘life skills management’ a good team of voluntary social workers are now deploying training programs to empower the neediest of the society. At source, building up the Self Esteem of the individual is the prime objective and the initial spark. Learning to love self before sharing love. Was given to me last night by a friend an audio course by Nathaniel Braden which I found most interesting. Self-esteem, key to success. How poor self-esteem is a root cause of every known psychological malady. The two components of self-esteem. What growth leads to. Nurturing self-esteem. A victory in the evolution of consciousness. Self-concept defined. Withdrawing your investment in false values. Is it wise to “tap into” the child-self that dwells within? What happens when the child-self is integrated? Exploring your own feelings toward the child you once were. The story of Charles. Eva’s story. Social consequences of high and low self-esteem. The vices of a person with a weak ego. Ethics of rational self-interest. Humoring the self. Living consciously. The core biological fact of your existence. A commitment to awareness. Examples of living consciously and unconsciously. The different paths people take, as illustrated by the stories five men and five women tell, taken from actual case histories. Intellectual independence. A pen and paper exercise. Taking responsibility for starting. The challenge. Why self-acceptance is required for growth. Respect for reality. The alternative to being at war with yourself. Handling fear. A way to explore the world of self-acceptance. More actual case histories. A powerful technique for enhancing self-acceptance. What accepting yourself entails. Facing what you dread. Why self-acceptance is a truly heroic act. Experimenting each day with new instances of self-acceptance. Feeling guilty because we choose to, or because we think it’s what society expects. Valuing your judgment over that of others. Is it really guilt, or is it undealt-with resentment? Or fear of self-assertion? Behaviors that undermine your sense of integrity. Why people become attached to guilt. The internal drama. Can you embrace and “forgive” the child you once were? How current rejection could have roots in your past. What do you want for your child-self—assimilation and integration into the total self … or alienated oblivion? Ways to befriend and integrate your child-self. Meeting and dealing with your teenage-self. Why you must hold yourself responsible for matters within your control. Self-responsibility as an exhilarating and empowering experience. An exercise for those serious about increasing self-esteem. What you must grasp to enjoy an active orientation to life. The lies most devastating to your self-esteem. What high self-esteem demands. The incorrect teachings and admonishments of our elders. Basic issues to confront for living authentically. What to do if you feel you are presently living lies. Lessons from top psychotherapists. How effective therapists conduct themselves. What we must do to understand others. Inspiring the best in others. The value of presenting them with a rational impression of reality. By honoring the self, we help build a community of persons with healthy self-esteem. Living up to the supreme value of your life. Protecting your self-esteem. Serving self-esteem by living benevolently. Six behaviors to raise your self-esteem. Why growing in self-esteem may mean leaving your comfort zone and striking out for the unknown. Expect a sense of disorientation. Why some regress. The rewards of this program. I took much pleasure in reading the second edition of the Caritas Newsletter August 2009. 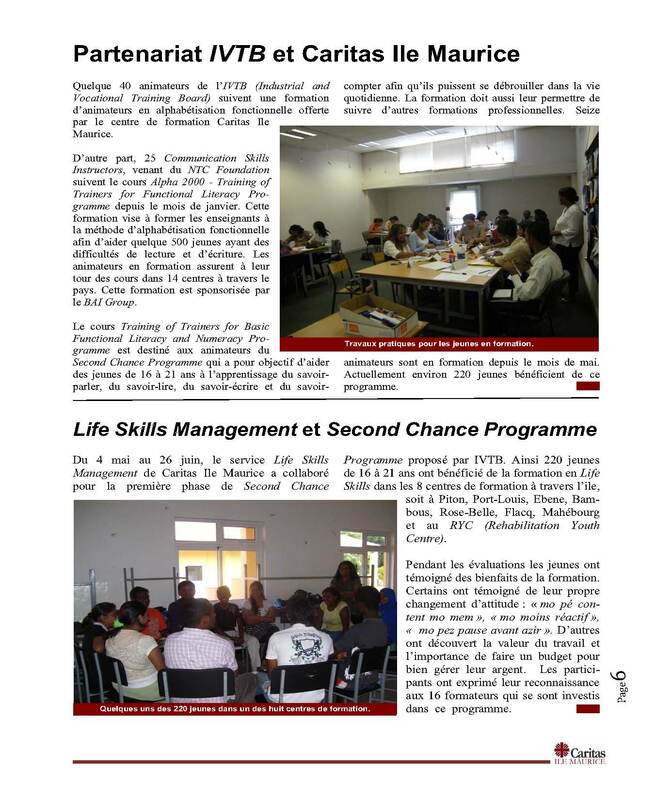 What most interested me was to learn of the Caritas partnership with the government with Life Skills management and the Second chance programme. Jean Claude de l’Estrac who was chairing the National Empowerment program re-oriented the program to start building the self esteem of the needy before training them for a job. He assesed that the original program was not yielding the results planned because of the lack of confidence of the poor of the poorest. The society has ignored them for too long, they have lost the sense of being a worthy human. Let us hope that Caritas and all those working in this field have now found the good thread!